So…Saturday the 26th finally came! What a great experience, going back in time even further. 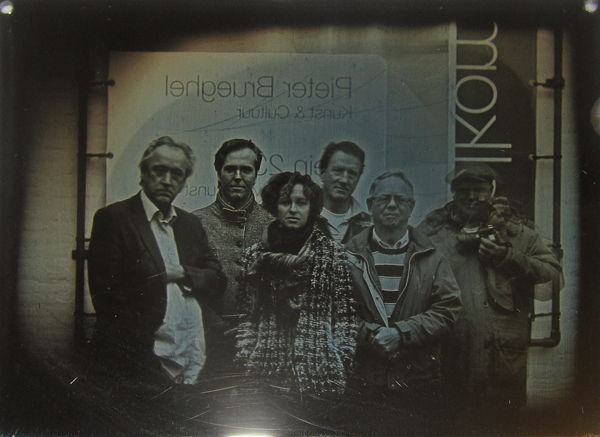 I did not sign up for this workshop with the intention of making my own daguerreotypes but merely to enjoy some more history and to really grasp what this process is all about. You can read all you want but actually seeing it makes it a whole different ball game. 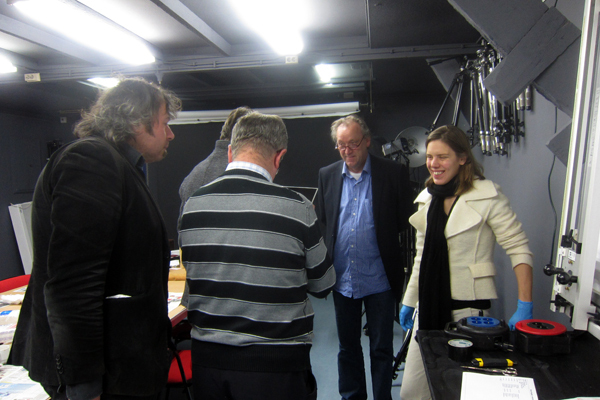 Marinus Ortelee and Charlotte Edam did a fantastic job sharing this process and sharing their unbridled enthusiasm! I’ll post the process as we went through it below. I hope I remember everything correctly. If someone notices any flaws or whatever please contact me so I can adjust it. I don’t want no misinformation on here! Oh, and beware…LOTS of photos! P.s. For a short explanation of the process click here. The start of the process: take a whole lot of perseverance and a copper plate and polish it for about 6 hours on end. Luckily for us Marinus and Charlotte already prepared the plates we were gonna use so this was merely to let us feel what an incredible job it is to polish these plates for so many hours on end. Getting them spotless is an absolute must to be able to make good plates. I was already looking for shortcuts with the glass plates for collodion (dishwasher) but this takes true patience and perseverance. My utmost respect! The polishing is being done with a bit of oil and some grounded pumi stone. The finer polishing is being achieved by using kaput mortuum which is a red powder consisting essentially of ferric oxide, also used as a dye for painting. After the plate has been polished until the surface is impeccable the plate is being galvanized in order to create a thin silver layer unto the plate. After that the plate is being buffed using three different ones, going from fine to finest buffing. The first buff also uses a bit of kaput mortuum, but then treated to get it even in a finer state, the second one is of untreated leather but finer than the first and the last one uses a flannel cloth as the finest way of buffing the plate. Now it’s ALMOST ready to be fumed! 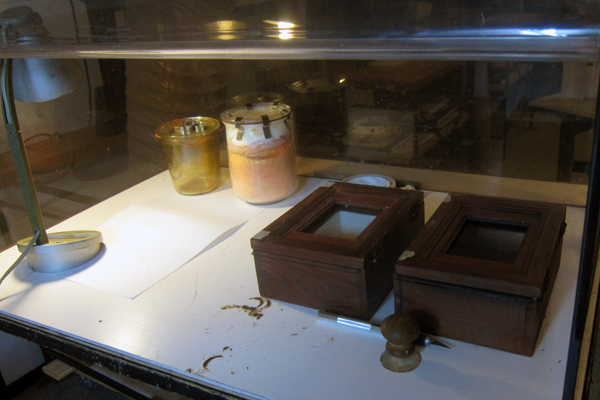 Daguerreotypes need a different setup in the darkroom so I'll try to explain. On the left you see a fume cupboard, suction drainage is very important for the fumes (!). You see two wooden boxes on the right in the cupboard. 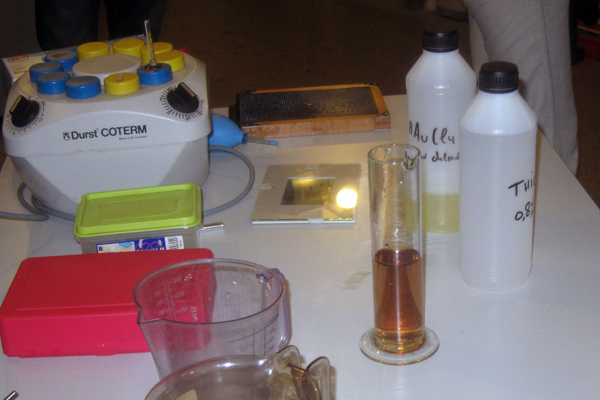 The one on the left contains the Bromine, the one on the right contains the Iodine. 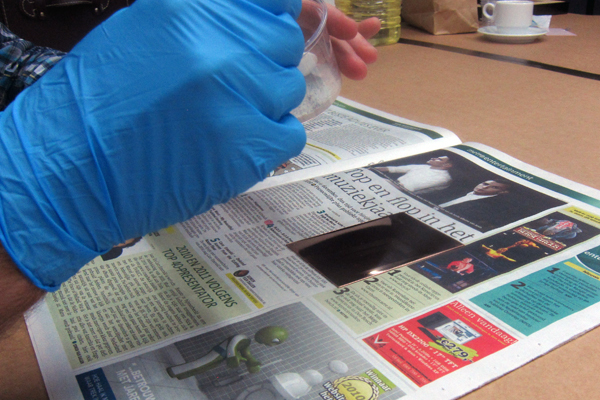 They are used to fume the plate with in order to sensitize it. On the table on the right is the "fixer", the rinsing bath, the toner etc. for finishing of the plate. Developing happens elsewhere but we'll get to that soon. Here you can see the table on the right better where the plate is being finished. Here you can see the boxes inside the cupboard closer. If you look closely you can see the actual lid of the box is made from plexiglass. You can pull it out when the plate is placed on the top upside down to let the fumes hit the surface of the plate. This way the fumes are kept in the box as much as possible. The fumes that do escape are being sucked out via the drainage system. It's a very clever system and very cheap as well. The boxes come from Xenos and just need a little modification to make it work. In front of the boxes you see the sectorial disk used to carry and hold the plate so that you won't pollute it with your hands. A cleaned and totally prepared plate waiting to be fumed. 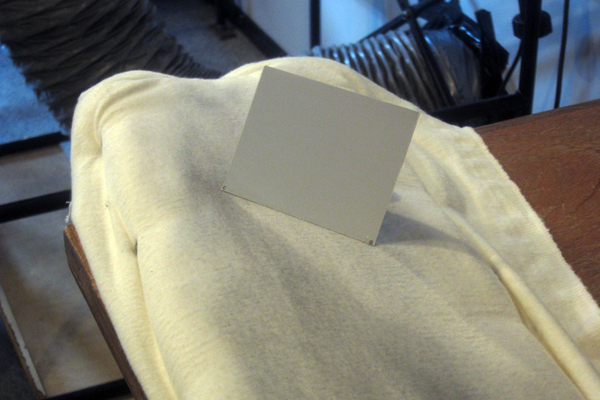 The plate is sitting on a buff covered with flannel for the last and final buffing. 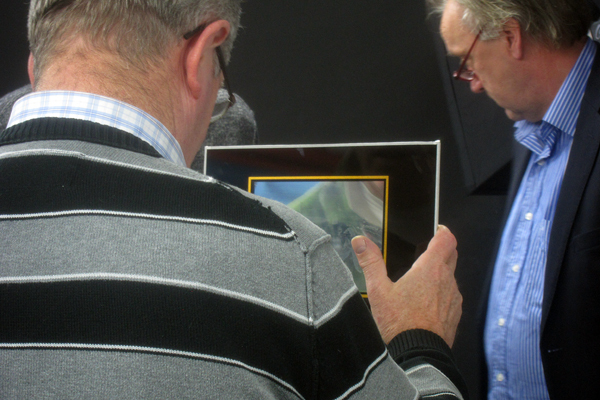 The group looking at a daguerreotype presented in passe-partout. 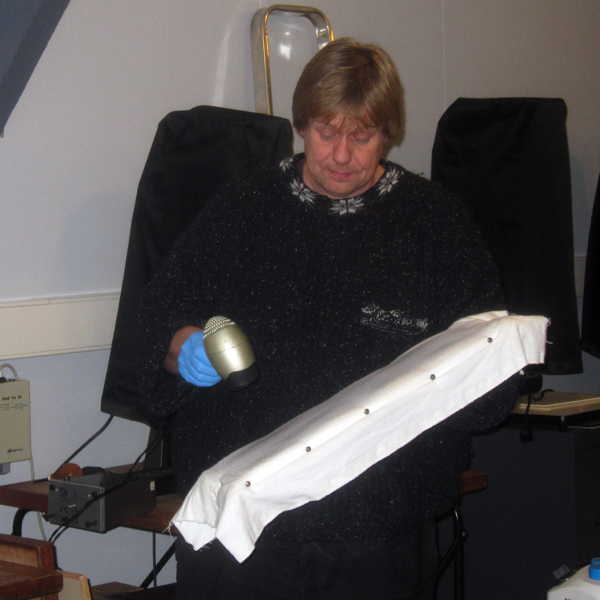 The final buffing of the plate starts with heating up the buff a little using a hair dryer. And the final buffing of the plate, done to heaten up the plate a little before it goes onto the fuming boxes. This has to be done evenly so that the fuming layer will be even as well. 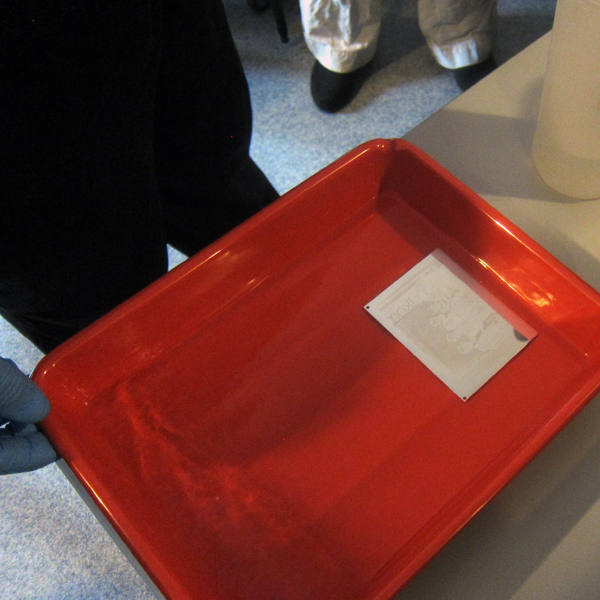 The plate goes unto the first fuming box containing the Iodine. The plate goes through different stages of colors here, going from yellow to pink to green, back to yellow etc. and all shades in between. The color that the plate needs to have is dependent on what type of weather you're in, which contrast your subject has, the desired result you have in mind etc. Typically the plate has to be somewhere between yellow and pink which, in this case, took about 60 seconds. Then it's being placed in the Bromine box for about half a minute. 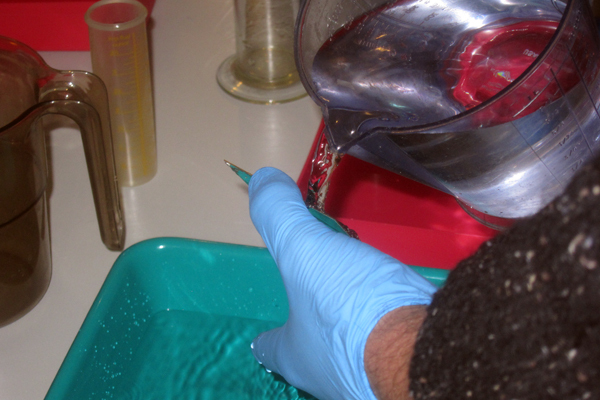 Then back onto the Iodine for another 6 seconds and then it's ready to be placed in the back of the camera. This has to be done in subdued light as the plate has reached its sensitivity to light. From now you have about half an hour to make and develop the photo. 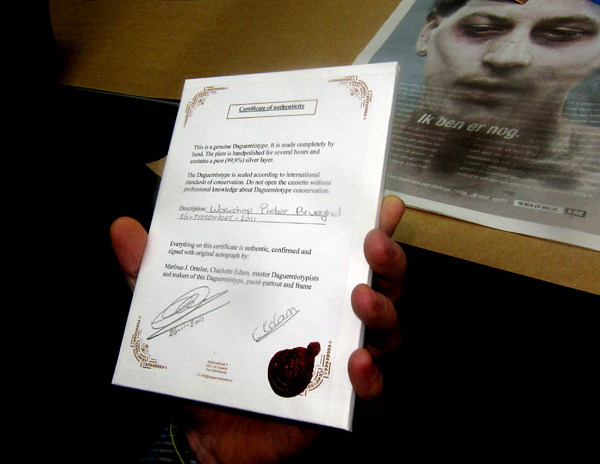 Noticeably longer than the 5 minutes in Collodion! Here you can see that the silver plate has turned yellow. 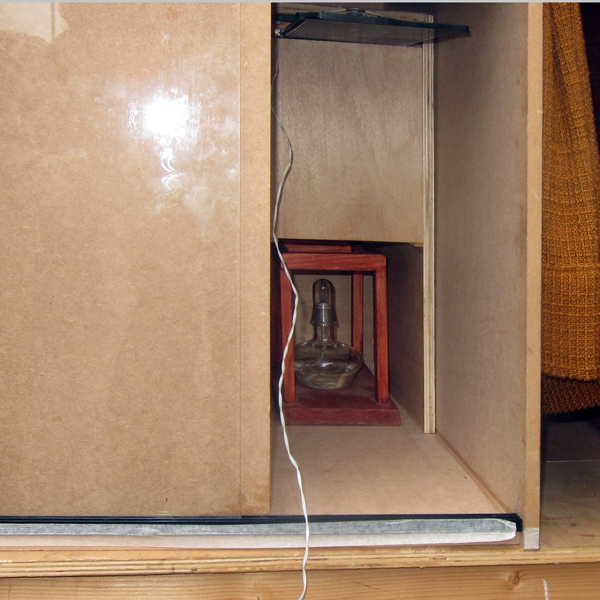 This photo shows the plate unto the fuming box with the sort of doorknob on top to handle it. 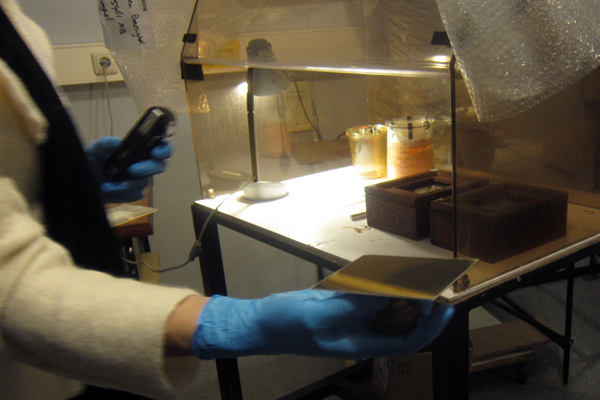 You can also see the plexiglass lid having been pulled out of the box to let the fumes hit the plate. As a side note..the plate can be prepared with Iodine only. It’s not necessarily needed to use Bromine. BUT (yes, there’s always one of those) the Bromine makes for a better contrast and detail in the plate. 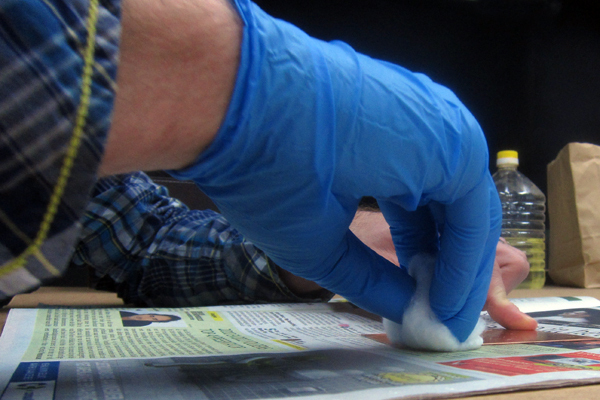 More mid tones can be achieved than when just working with the Iodine. 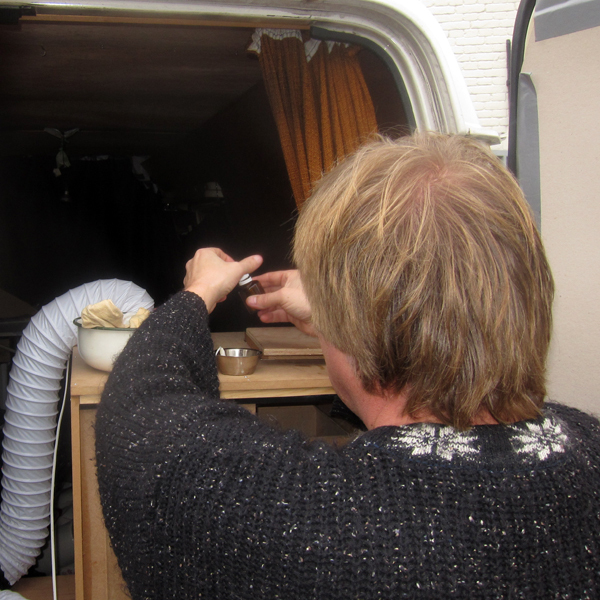 The plate has been exposed, now on to the developing stage which happens inside the van. The developing process is done using mercury fumes. 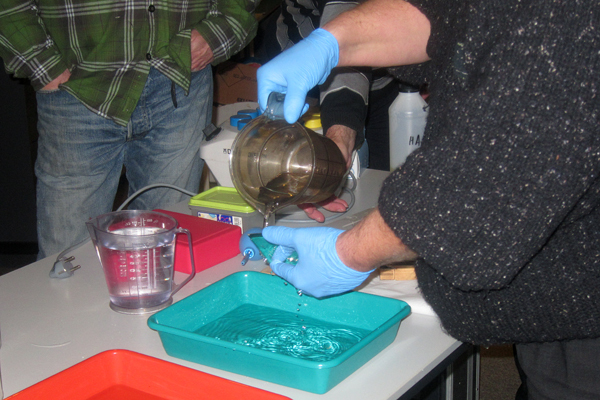 For safety reasons this did not take place in the darkroom to keep the mercury as far away as possible from the Bromine and Iodine. 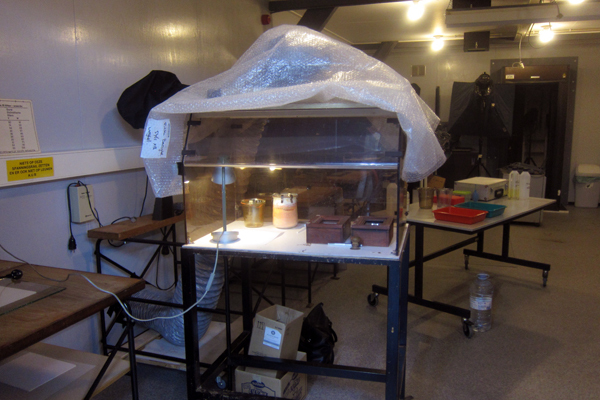 The developing is being done in a sealed off box, again with an air drainage attached to it. 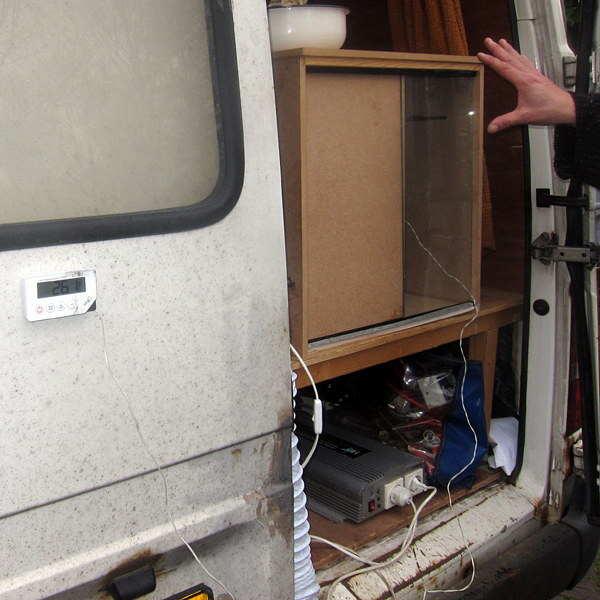 The mercury is being heated up to about 65 degrees which is monitored outside the van using a digital thermometer. The mercury is being heated using an alcohol lamp. The white cable you can see popping out is the cable to the thermometer which leads to the read-of-screen attached on the outside of the van. After the mercury has been heated to the desired temperature the lamp is being "turned" off and mercury is being cooled down until it reaches about 30 degrees. The fumes forming in that time should normally be enough to develop the plate completely. If, after carefully checking the plate, the desired result is not met, the mercury is being heated up again and the process repeats itself. 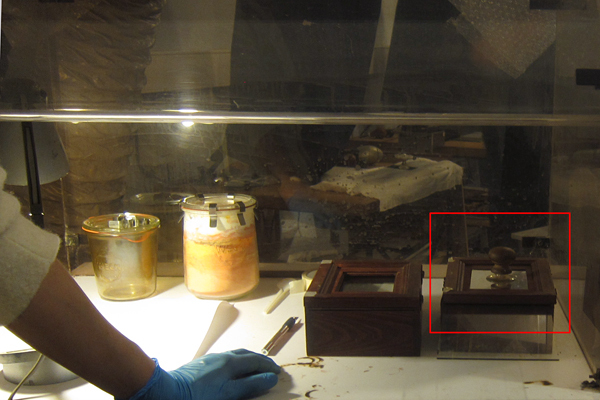 Here you can see the thermometer on the left with the plate in the wooden box on the right, developing. 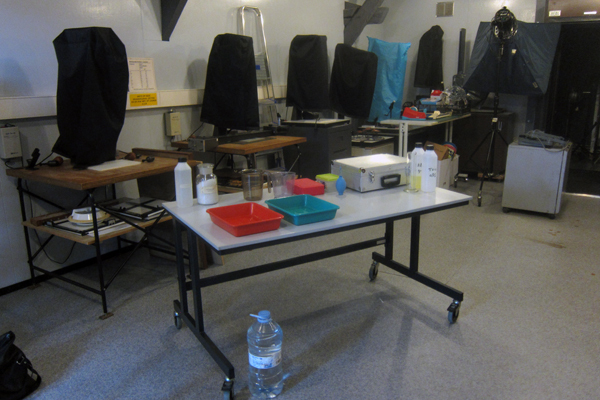 Development approved and back to the darkroom where the unexposed silver can be washed off using thiosulphate for about 4 minutes. Then rinsing with a about a liter of distilled water. You can then blow of the drops of water with an air blower and leave it to dry. Next step: preparing the gold toner. 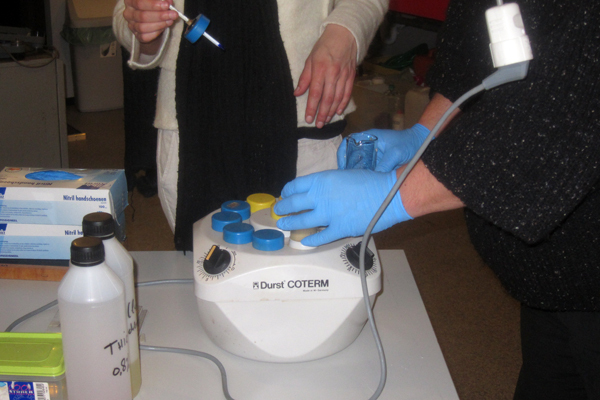 This mixture contains two dillutions: gold toner (2%) and thiosulphate (0,8%). When first brought together the mixture turns very dark. You have to let it sit until it clears again completely and then the mixture has to be heaten up until 45 degrees celcius. Time for coffee! A Durst Coterm is being used for the heating. 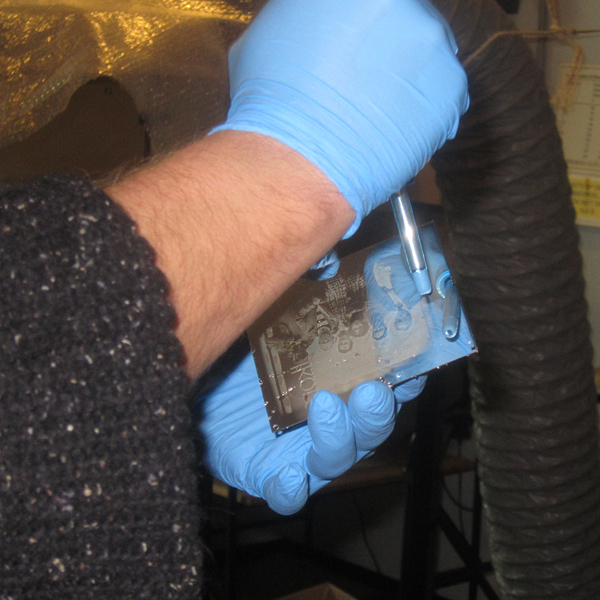 After the coffee the plate was being put to the top of the tray, the gold toner poured in the lower part. When enough the mixture got flown in one move over the plate to get evenly done. This took about 4 minutes and the plate got his goldish shine meaning it's good for a whole lot a years to come. Again the plate is being rinsed with water and the water drops blown off with an air blower. Now the plate is ready to dry out and prepare for matting and framing. A proper dry takes about 2 days to complete. Voila...the result!!! A better photo will be send to me so hang on tight for that! This digital copy does this type of image no good. The original is fascinating beyond words! The matting has been finished. It only needs a proper backing and... Done! Here a great day came to an end. Lot's to talk about as we sat around the table discussing the experience and listening to the many stories Marinus and Charlotte were eager to share. Thank you once again Marinus and Charlotte. You did a great job and you’re fascinating people! 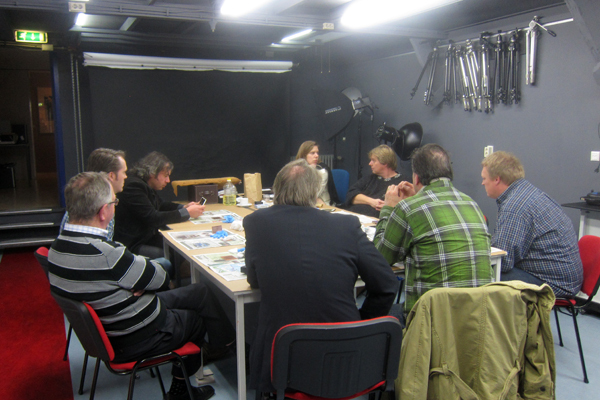 Also a big thanks to the Pieter Brueghel Center who are cool enough to organize these sort of things! This entry was posted on November 27, 2011 by Contrastique. 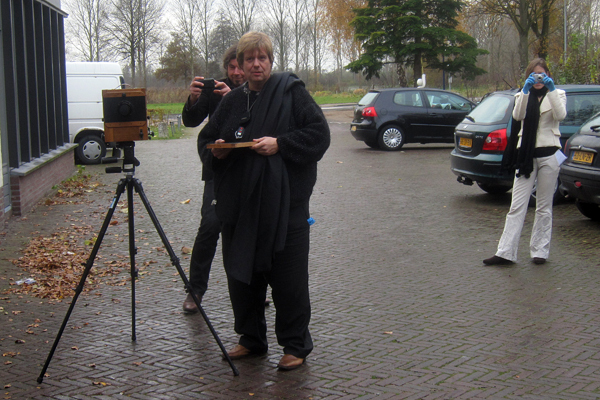 It was filed under Daguerreotypes and was tagged with 1837, charlotte edam, daguerre, daguerreotype, louis daguerre, marinus ortelee, pieter brueghel veghel, workshop.